In a way, Django Unchained is the ultimate culmination of Quentin Tarantino’s career: a gory blaxploitation western. Tarantino has long flaunted his love of 70s era grindhouse cinema as well as Sergio Leone westerns. Jackie Brown was his most overt ode to blaxploitation, but many of his films contain nods to the badass films of Pam Grier and Melvin Van Peebles. His love for spaghetti westerns is also blatantly worn on his sleeve. The Kill Bill films and Inglorious Basterds were basically westerns in disguise. Django Unchained finds Tarantino finally working in the era of the western, and, therefore, it’s his most straightforward exploration of the western genre. It is also his most genuine exploration of the blaxploitation genre, despite Jackie Brown‘s cast and subject matter. To cut to the chase: this film is not racist and, in fact, presents a pretty powerful message about slavery. 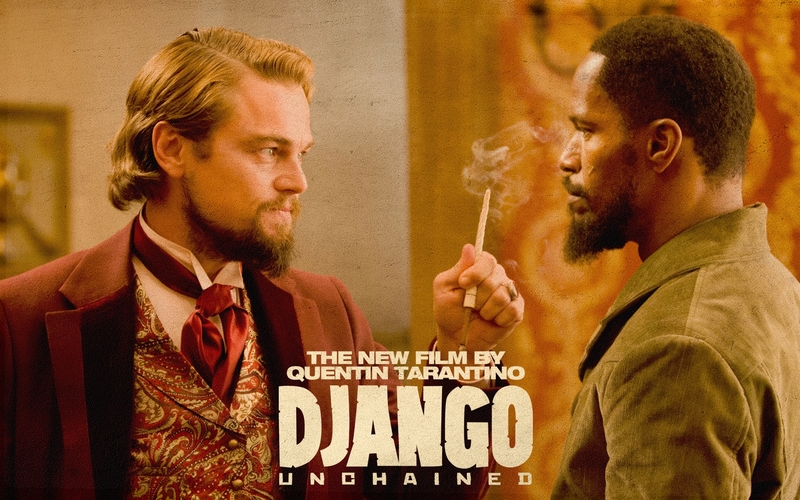 The story revolves around the eponymous Django (Jamie Foxx) and Dr. Schultz (Christoph Waltz), and their quest to find Django’s wife as well as collect bounty on no-good white criminals along the way. Dr. Schultz frees Django and introduces him to the bounty hunting game, while also agreeing to help Django track down his beautiful wife (Kerry Washington) who is owned by the vicious slave owner Calvin Candie (Leonardo DiCaprio). The first half of the film follows Django and Dr. Shultz as they bond and kill evil white men. DiCaprio doesn’t pop up until the second half, when the heroes finally track down Django’s wife to DiCaprio’s plantation. Despite the film’s length – and length of time before a real antagonist pops up – the film never drags. This is a credit to Tarantino’s writing as well as his eye for staging a scene. The man presents scene after entertaining scene, and none of them feel superfluous. Tarantino walks a tight rope through most of the film, showcasing the horror of slavery (very bluntly and brutally, at that), while also being the funniest film Tarantino has made. This is where the controversy comes in. Many critics and a few other filmmakers (Spike Lee, who else?) have criticized Tarantino for gleefully using the n-word and for inserting comedy into a film about slavery. Spike Lee’s criticism deserves to be out rightly dismissed because he hasn’t seen the film, but comedy can be a powerful tool in social commentary. One of the funniest scenes in the film showcases the Klan as a bunch of idiots who can’t see properly through the bags on their heads. Tarantino ridicules them, and ridicule takes away their power. And as for the use of the n-word, this film takes place in a time when the word was used all the time, and to pretend it wasn’t is to white wash history. And has everyone forgot about Blazing Saddles? Mel Brooks was doing this stuff in the 70s! No one’s talking about what a bad influence he is on American audiences. Now, despite all the controversy, this is a really good film. Is it Tarantino’s best? Definitely not. But it is one of his best, and surely one of the best films of the year. Say what you will about Tarantino as a person or the subject matter of his films, no one can deny his firm grasp on the medium. The craft behind this film is top notch. And Tarantino’s love for film can be felt behind every shot. In a time when many films can feel cynical and calculated, Tarantino’s enthusiasm is such a breath of fresh air. It also helps that Tarantino has a brilliant cast working at the top of their game. Foxx, Waltz, DiCaprio, and Samuel L. Jackson, as the nefarious Stephen, all give award worthy performances. If you’re squeamish about violence and language, stay away from this film – and from any Tarantino film, for that matter. For everyone else, however, this is a must see. This entry was posted in Reviews and tagged Blaxploitation, Christoph Waltz, Django Unchained, Film, Jamie Foxx, Leonardo DiCaprio, Movie, Quentin Tarantino, Review, Samuel L. Jackson, Western. Bookmark the permalink.